We took 5 cans of Albacore from the Ocean Harvest to our traditional Christmas Dinner at Mom’s house in Salem. We decided to leave them in the tins so everyone could see what flavor they were trying and we put out some crackers next to them. So there on the table with the traditional turkey and all the fixin’s sat 5 tins of tuna. They were the hit of the dinner! My favorite was the Peppercorn, my sister’s was the Pesto, my brother favored the Jalapeno and my husband’s was whichever one he was eating at the moment. My Mom & Dad used to can Albacore that they bought off a Newport boat and this stuff was as good as theirs was (and that’s saying a lot). Solid tuna in its own natural juices…no water or oil. 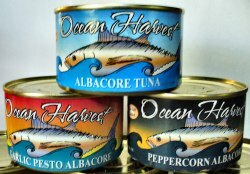 If you havn’t had fresh canned Albacore from The Ocean Harvest you haven’t been living right. Thanks to Captain Tyler and the crew of the FV Harvester. Go get some today. They’ve also got six packs and three packs of canned Dungeness crab for you and your family pulled from the bottom of the Pacific Ocean right off the Oregon Coast and the Albacore is canned fresh the same day that it's caught. We KNOW you'll enjoy it!!! To order the Oregon Coast’s very best Albacore tuna or Dungeness crab, shipped or local pick up, visit The Ocean Harvest at www.theoceanharvest.com.